I love Chamomile tea. With lots of honey and cream. It has been raining like cats and dogs, so a hot cup of tea brings me comfort and joy. I love Chamomile tea so much that I just used my last tea bag, last night! Oh shoot! I have about 800 different teas and not one chamomile tea left. So for this recipe, I am using a tea that I have never tried before. I won this tea in a contest. I know it is from England, the package says Wilkinsons of Norwich, with a British telephone number. I just want to call them and say, ” Cheerio ‘Ol Chap”!! The name is handwritten, Mediterranean Sun Tisone. It smells like sunshine, ginger, orange peels and rose. Nice combo, right?? When steeped the color is a beautiful shade of deep rose. I know you probably don’t have this tea, but you can use any tea you like, Earl Grey, Chamomile, experiment! Since this tea is loose, not bagged, it isn’t powdery, lots of twigs and leaves and peel, I used my coffee grinder and ground the tea to make it a better consistency for a cupcake. These cupcakes are so tender and light. They bring me back to London and the memories of cakes and cookies and tarts of a high tea. 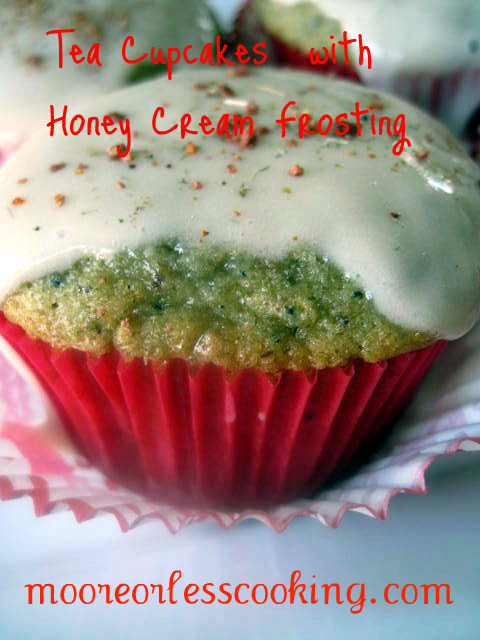 The Honey Cream frosting is the perfect addition for these delicious cupcakes. Place a rack in the upper third of the oven and preheat oven to 325 degrees F. Line a cupcake pan with paper or foil liners and set aside. To make the cakes: in the bowl of an electric stand mixer fitted with a paddle attachment, cream together butter, flour, sugar, baking powder, baking soda, pinch of salt, and tea leaves. Mix on medium speed until the mixture is slightly coarse and sandy. For about 5 minutes. Pour half of the milk mixture into the flour mixture. Beat until just incorporated. Pour in the remaining milk mixture, turn the mixer up to medium-high speed and beat for 1 minutes, until well blended. Divide the batter between the prepared cups. There is not a lot of batter so you’ll only fill the cups up half way. You will also need to scrape the bowl for remaining batter. You don't want to waste a drop. Bake the cupcakes for 17 to 20 minutes, or until a toothpick inserted in the center comes out clean. Remove from the oven and allow to cool in the pan for 10 minutes. Remove the cupcakes from the pan to cool completely before frosting. To make the frosting: in a medium bowl, whisk together powdered sugar, honey, cream, and salt. Whisk until smooth. 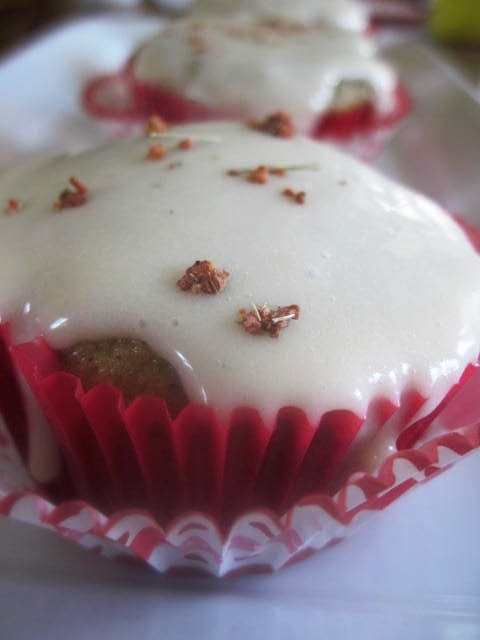 Use a butter knife to generously spread the frosting atop the cooled cupcakes. Sprinkle with just a bit of tea leaves. Cupcakes will last, well wrapped, at room temperature for up to three days. Divide the batter between the prepared cups. There is not a lot of batter so you’ll only fill the cups up half way. You will also need to scrape the bowl for remaining batter. You don’t want to waste a drop.